Phoenix Commercial Ventures Ltd (www.pcvltd.com) is proud to announce that Hana Electronics JVC (a 50/50 joint venture based in the DPRK) completed and moved into its new headquarters based near the T’ongil Market in Pyongyang in Q1 2011. Having moved in and set up its production facilities, Hana has now opened a restaurant (“The Restaurant at Hana”) and related leisure facilities (swimming pool, sauna, hairdresser, bar, gym etc) in its headquarters. The restaurant (which comprises a main dining room and several private ones) and leisure facilities are open to locals and foreigners alike. The menu comprises mainly Korean dishes, together with a few Western ones. Food for the restaurant is sourced from local markets. A video and photos of the restaurant can be viewed on the Phoenix website. Phoenix Commercial Ventures Ltd offers investors business and investment opportunities in the Democratic People’s Republic of Korea (DPRK), enabling them to take advantage of the economic reforms that are taking place there. Hana was established in May 2003. In 2004 it began manufacturing and selling DVD and VCD players, as well as pressing and selling CD’s. When the company first began operations it employed barely a handful of people. Now it employs over 200 people, and has thus become a major employer with significant social responsibilities which it takes very seriously. 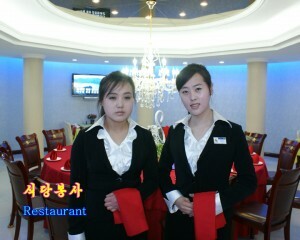 Hana have established a nationwide distribution network throughout the major cities in the DPRK. Whilst they manufactured and marketed CD’s, they had an exclusive long term contract with the Mansudae Arts Centre, which belongs to the Ministry of Culture, one of the partners in the JV, for 300 works including; movies, karaoke and other music. They now produce and sell a range of DVD players, and will move into other consumer electronics products. Hana is now ranked as one of the top three best performing joint ventures in DPRK, as assessed by the Ministry of Finance. • Hana intends to diversify and expand their range of products. • Hana moved into its newly constructed building, next to the T’ongil Market, in Q1 2011. • Hana has also opened a restaurant (“The Restaurant at Hana”) and leisure facilities (including a swimming pool) in its new building. The restaurant and leisure facilities are open to locals and foreigners alike.